It might be radical, but the soundhole placement is a revelation. Great for modern fingerstyle players. Clever, innovative design that genuinely improves the playing experience and tone. Flawless build. Excellent value for money. You'll invite comment playing this instrument - and we imagine it won't all be positive. Avian is a brand that's pretty new to the UK, so what's the story? Owned by Brits Tim Oulton and Roger Kimp, the company has its head office in Hong Kong, while manufacturing takes place in a workshop near Guangzhou, China. Oulton and Kimp maintain a continuous presence in the area to ensure that both quality and the workshop environment are maintained to their required standard. "The overall build quality and detail here is hard to fault - this is a very nicely made guitar"
The guitars themselves are designed by highly regarded American luthiers Michael Bashkin and Harry Fleishman, and Bashkin travels regularly to China to make sure all is well from his perspective. In short, a thoroughly modern guitar company and some modern designs, too, with quite daring aesthetics complemented by beautifully figured solid woods, subtle points of detail and decoration, and stunning attention to build quality and finish. Nice. Classed as a grand auditorium, the Skylark is one of the more radical-looking acoustics we've seen in recent years. Like all the Avian guitars, it's made from all-solid wood ( mahogany back and sides) with a fastidious attention to detail - it's a really crisp Taylor-esque build. 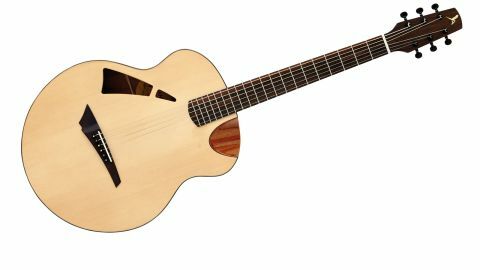 The concept behind the Skylark's appearance is this: reshape and shift the soundhole closer to the edge of the top, while placing the bridge in the centre of the rounded lower bout. This stiffens the top and creates a larger uninterrupted soundboard, leading to a relatively bigger sound for an instrument of this size. The so-called 'demi' cutaway aims to give comfortable access to the upper frets without losing air volume inside the guitar, which some say compromises resonance. So, instead of a standard cutaway, it's more like a scoop has been taken out of a non-cutaway guitar. It certainly works and is very comfortable, giving the heel of the hand a nicely engineered support when playing up at the body end. The overall build quality and detail here is hard to fault - this is a very nicely made guitar. Yes, we expect Chinese-origin instruments to be more affordable than, for example, a USA-built guitar, but the specification is nonetheless impressive. We have an Alaskan Sitka spruce top with scalloped X-bracing, a nicely cut and shaped bone nut and saddles, and an ebony bridge. All the binding and purfling is solid wood and immaculately cut, particularly impressive around the demi-cutaway. "All the dynamics and tonal variety are here if you approach it with respect"
Internally, things are spick and span, too, with reinforcing bars for the solid sides and very crisp craft. Our only gripe is the immaculate finish seems a little thick. The neck is from two quartersawn pieces of mahogany separated by a 6mm strip of maple - there's no stacked heel here, either. With a relatively shallow, slightly U-shaped profile, combined with the light camber of the matching-wood-bound rosewood 'board, we have an action that is low and fast and is the key to the subtle, precise feel of this instrument. The shape and placement of the Skylark's soundhole directs the sound more immediately to the player's ear. We love this. If you want to play the guitar and have an audience's perspective on your sound, this will get you very close. It's an intimate experience, even a confidence boost if you need it. It also means, from the player's perspective, the guitar is tonally quite distinct. But from the perspective of a listener, or when recorded, the differences between it and, for instance, a model with a soundhole e.g. the Avian Songbird, are understandably less marked. There's a modern, piano-like sound: lots of air and bags of sustain with a pristine delicacy and clarity as the note decays. Actually, the name works well in conjuring an atmosphere of delicate musicality, which the guitar absolutely lives up to. In the heat of our early enthusiasm, we did experience a little fret buzz, but our attitude was wrong. All the dynamics and tonal variety are here if you approach it with respect. And the elongated headstock is not simply about style, either: it allows a longer string length, from the nut to the tuners, and with it higher string tension, so detuning works extremely well. If your idea of playing an acoustic is all about heartily strumming on a big ol' dreadnought, you probably won't be drawn to this guitar. But if you care to adjust your approach to suit the refined build of an innovative instrument, then like us, you might be very impressed and become highly attached. It sounds contemporary and exciting and has proved a pleasure to play. Sure, the aesthetics will not be to everyone's taste, but they look sharp, and to those who complain that guitar design has ossified, the Skylark could be just the evolution you crave. Find fault if you can, but at this price we really can't.